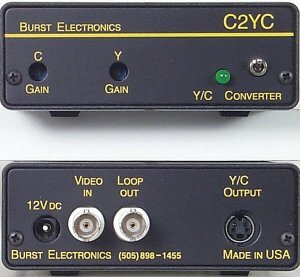 The C2YC format converter accepts an NTSC composite video input and splits it into Y/C (also called S-Video, S-VHS and Hi8). The C2YC converter is a 2 H Digital adaptive comb filter giving high precision Y/C separation. The Y (luminance) and C (chromance) signal levels can be individually adjusted.